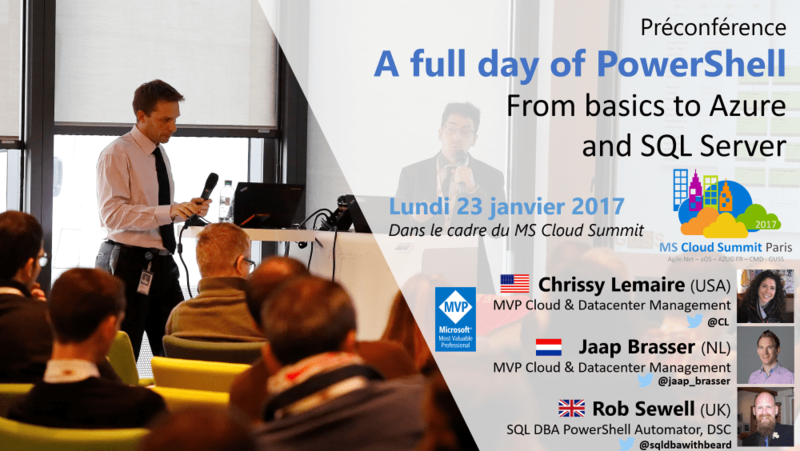 On the 23rd of January, I will be presenting, together with Chrissy Lemaire and Rob Sewell, at the MS Cloud Summit in Paris. Together we will be taking you through the basics of PowerShell Automation, Azure and SQL Server. Rob and Chrissy will be showcasing the capabilities of the DbaTools PowerShell module. There are currently only tickets available for the pre-conference sessions, so if you did not decide yet there is still a change to join us there. This entry was posted in Microsoft, PowerShell and tagged Azure, Event, MS Cloud Summit Paris, MSCloudSummit, PowerShell, SQL Server on 2017-01-17 by Jaap Brasser.